Vonnie was born in Clyde, Central Otago, she has a Fine Arts Degree from Canterbury University and is a Post Graduate of Massey University.She has worked as an illustrator for the University of British Columbia, Canterbury and Massey Universities and is the Illustrator of the "Maketu" series of children's books by Taramea Publishing. Vonnie's paintings celebrate the colour and light aspects of what are unique New Zealand landscape compositions, particularly the Manawatu. International Exhibitions include, Vancouver, (Canada), Missoula, (Montana), (supported in part by a Palmerston North City Council Creative Arts Grant) , and St Louis, (Illinois). as a result of her International Reputation she was awarded a Resident Artist Scholarship to Southern Illinois University in 2006. 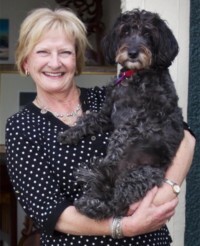 Vonnie has exhibited widely in New Zealand both as an invited artist and solo exhibitor. "I paint because I do not know how not to! Growing up within the surrounds of the Clutha and now the Manawatu rivers mean water described gorges and plains are so much a part of who I am. Overwhelming light, skies, seasons, and landforms allow me enormous compositional scope. I am convinced there is a connection between painter and landscape that is emotionally intimate. My particular connection is the Manawatu river and the way old macrocarpa and Nikau punctuate this regions' landscape. My endeavour is to construct beautiful paintings, with that little extra something, born out of the gift I have been given." It’s always such a pleasure to paint these native palms, they are always individuals with personalities. These Nikau are a composition created from my sketch book. This painting is the product of an early morning walk, the sun has just begun to warm the day. The colours are a lovely balance describing shadow and light. Gorge paintings are increasingly difficult to achieve on site, this one was sketched just above the Gorge walk carpark and completed back in the studio. Summer in the Manawatu, these lovely jersey cows were picnicking in the afternoon. A plien air beginning and the painting was finished in the studio. Sunlight, transparency, stones in the water are always fascinating and challenging. This work is particularly peaceful and descriptive of the Tiritea stream. I call this ‘a painted sketch’. Briefly drawn Plein Air on the way up the Pohangina. It has the energy and honesty that always look for in my work. Describing the Beautiful Rangitikei River and surrounds on a summers day. Painted partially Plein Air. Fabulous warm tones complete this beautifully lit composition. A joy to paint. A peaceful painting describing early mornings on the Manawatu River walkway ... the best time of day. This work uses scarffito to draw the image prior to applying layering acrylics wash and glaze.The work was drawn on site near the tank on the hill above the Reserve cliffs. With Totara Reserve in the left for ground. The river is the Pohangina. This painting is inspired by the paddock on the right at the Te Matai Road end of the Manawatu River walkway. The colours are as I saw them, vivid and vital.... typical of a Manawatu summer. I have some beautiful Paua Shells and and precious old Kete .... just had to put them together in a still life. I enjoyed stylising the subjects in this painting, sadly this painting is iconic ... owing to the Gorge closure. The energy of these lovely old trees is described in warm siennas. Macrocarpa so much a part of the Manawatu rural scene. Just past Totara Reserve. Sketched and Painted Plein Air. (on Location).